Dr. Glenn Selk, Oklahoma State University Emeritus Extension Animal Scientist, offers herd health advice as part of the weekly series known as the "Cow Calf Corner" published electronically by Dr. Peel and Dr. Glenn Selk. Today, Dr. Selk encourages producers to maintain their replacement heifers' nutritional requirements and body conditions ahead of spring breeding season, citing supportive OSU research. "As we get closer to April and the breeding season for replacement heifers that are destined for a spring calving herd, proper nutritional management is more important than ever. Some producers may have removed the heifers from wheat pasture at the appearance of first hollow stem. Others may “graze out” the wheat pasture and move the heifers to a dormant native or Bermuda pasture near working facilities for artificial insemination. In some cases this winter the heifers have been fed supplement and hay. "The heifers will be turned in with the bulls or put on a synchronization program to be bred in April. In many cases this means that the heifers must be moved from one location to another that is closer to working facilities. The trick, of course, is to not let those heifers go on a steep downslide in body condition as we approach the breeding season. Research has shown that if heifers (near the time of reaching puberty) undergo a severe reduction in dietary intake of protein and especially energy, breeding success may be disappointing. "Oklahoma State University researchers have studied the impact of short term energy restriction on ovulation rates of cycling replacement heifers. This trial is reported in the 2001 OSU Animal Science Research Report (White, et al.) The effects of acutely restricting nutrition on ovulation and metabolic hormones were evaluated in Angus x Hereford heifers. All of the heifers were housed in individual pens in a barn and fed a diet supplying 120% of their maintenance requirements for protein and energy (1.2 M) for 10 days to allow time to adjust to the environment and diet. All of the heifers were determined to be cycling at the conclusion of this adjustment period. Then the heifers were split into two groups. Half of the heifers were then fed a diet supplying either 40% of their maintenance requirements (.4 M). The other half of the heifers were continued on the original diet that supplied 120% (1.2 M) of the maintenance requirements. All heifers were injected with prostaglandin so they should ovulate on about day 14 of the trial. Seventy percent (7 of 10) of .4 M heifers did not ovulate as a response to the injection, whereas, all of the 1.2 M heifers had normal ovulation. 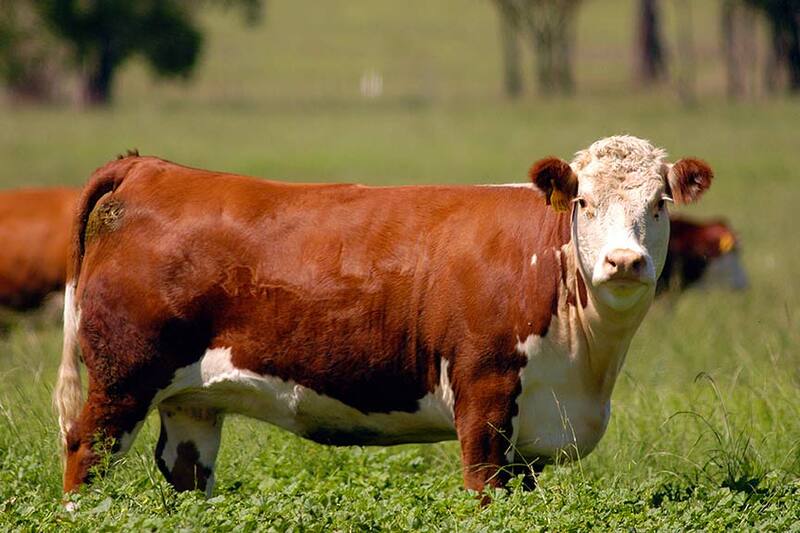 "In this study, restricting nutrient intake for 14 days prevented ovulation in a large percentage of beef heifers without altering visible body condition. Heifers should be managed to avoid short-term nutrient restriction to maintain normal estrous cycles."